Recently, a photo of a horse with a prosthetic leg has been roaming the internet(this horse was later put down because he didn’t get better). 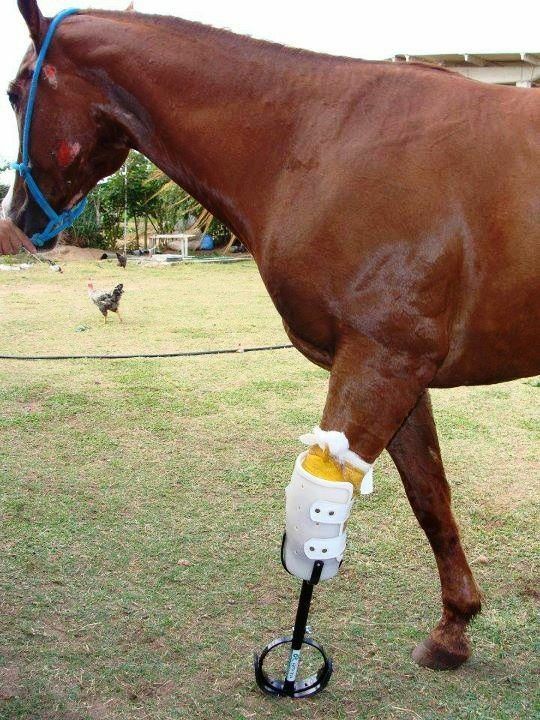 This is not the first time I have seen these “glory” cases of horses being “saved” with a prosthetic leg. So I give myself the opportunity to tell you why I would never choose this life for my horse. If I, as a horse owner, ever got into a situation where I had to choose if I would put my horse to sleep or do a surgery that will guarantee my horse pain and restrictions, there is no doubt what my answer would be. To be completely honest, I believe it is very selfish to keep a horse alive this way. Firstly the surgery aftermath. There will be months in and out of pain and adjustments. If the horse ever adapts to the prosthetic leg, there will still be pain from not only pressure wounds and sores, but think about the anatomy. The horse will not be able to use his body correct, which will most likely end up in heaps of lockings in their muscles. I don’t think any chiropractor would be able to correct that either. Photo above: This is the photo that was roaming around, creating heated discussions. Some may think that I am heartless for choosing to let my horse go to sleep instead of doing surgery, but think about the quality of their life. They will not be able to run with other horses, nor will they be able to buck out or roll around. These are basic things that horses enjoy doing almost every day, and taking that away from them, what life will they have? Exercise? Nope, forget it. Riding? Nada. I am not saying that a horse needs to be ridden to be happy, but no basic exercise or movement at all is not in a horse’s nature. I do not condone “pasture puff” horses from the start, so having a horse who won’t be able to use his body at all without being restricted is not a life I would wish for anyone. I know it is heartbreaking to say goodbye to your best friend, but sometimes saying goodbye is the best thing to do, and the most humane. I know there are a ton of people with other opinions, but at some forums it can go overboard. Today I was bashed for being a spoilt brat because I would rather let my horse go than to keep him alive in pain. Is this where we are at now? “My opinion is right and if you think otherwise, you are a spoilt brat”. This person also had to show being superior from 20 years of experience, which I to be honest, couldn’t care less about. It doesn’t take 20 years of experience to see that an animal is suffering. That, ladies and gentlemen, is basic humanity. To end off this post, I know there are many mixed opinions on the subject, but as we say in Norway, “a dead horse doesn’t suffer”. I agree that while these surgeries have been proven to work really well for other animals (dogs, cats) the technology is rubbish in horses. I am against prolonging a horses life like this. However, if the tech developed so that the horse had a quicker recovery time and it has less impact on their movement and day to day life, this could be a viable option in the future. While I don’t think it is fair to prolong any animals life if they are in pain just because you can’t make the hard decision. I believe that horses with mild pain such as arthritis can go on to live long and happy lives. So if this surgery could give the horse the same quality of life as some of our happily retired horses then I wouldn’t be so against it. This is a very good point, and I agree with you! If the aftermath pain and restrictions were worked on and improved, it wouldn’t been a bad option, but as it looks right now, it is indeed a rubbish technology for horses. I agree, I wouldn’t agree to a surgery that will guarantee my horse pain and restrictions now, BUT if the technology was developed so that the horse had a much higher chance of recovery I would start to lean towards doing it. Yes, Indeed! As it looks right now, there is no chance in the world for me to take that option, but if they somehow figure out how to improve this, I might be on board! It’s amazing what humans will put animals through for various reasons. I understand wanting to keep your horse around if he’s able to do much of what he used to. But you’re right, the surgery recovery and intense limitations would be too much pain and hardship to see trying to keep them alive. I agree! It wouldn’t be a “complete” life for a horse, I believe! I agree with you. It is kinder to let them go rather than suffer through something they wont understand. Its a lot of stress to put them through for the happiness of humans. Yes, I can’t believe what goes through their minds when they see a prosthetic leg instead of their own, and there is no way for us human to tell them how it works and why it is there..
“A dead horse doesn’t suffer.” Yes! What a great expression that is. I have had to put several horses down. I had to put my much loved horse Tommie down as he had several complications and was in pain. The insurance company told me they would not pay out unless I made him hold on for corrective shoeing and a lot of other stuff and he was in such pain I could not do it. I didn’t care about the money. I got another horse and in six months I had to have him put down as well. He had an odd neurological disorder and I knew that he would end up with no functional hind end. Why wait for that to happen? All the veterinary specialists who had worked on him at the State university in Florida supported me in my decision. I will not have my horse suffer. I agree with you about medical experimentation and prosthetic legs etc. Good post, Thanks for writing this. Thank you Anne, I am so sorry for your losses! But I think you made the right decision about letting them go. We put our animals through so much unnecessary pain if we keep on trying to help, sometimes letting go is the most humane thing. And yes, the expression is very much on point and true, hence why we Norwegians use it so much! I so agree with you Mathilde! I have been raised by a mother who is a nurse and takes a very pragmatic view on this matter. If we make the decision to own an animal of any kind then in my opinion we must take the responsibility to ensure that they are not only well cared for, but also that they do not suffer. Suffering comes in many forms, it is not just outright abuse or neglect, it is also the selfish decisions that people make to keep an animal alive because they do not want to let go. I 100% agree with you on this! People need to stop being selfish and think about what is right for the animal! Unfortunately there are too many companies and people out there thinking since they can easily make one for a dog, they can just make one for a horse. When there is failure (most of the time is because they don’t work with the vet) it gets way more publicity. I work for a large animal prosthetic orthotic company and we do have the engineering and material science behind our devices that allow for us to be successful in fitting horses and we never work without involvement of the vet. We build devices that help take a lot of the weight off of the bottom of their amputated limb because we know its not an area that can handle the weight. We also make our devices total contact so that there are no pressure sores or rubbing as long as the owner follows through with the wearing schedule and puts on the proper layer of socks. We see catastrophic failure because these non-equine specialty companies are using metal pipes which corrode & are not rated for the horse’s weight or use plastics (you never see an active 200 lb human wearing a plastic prosthesis so why on earth would you use that for a 1,200 lb animal) or even carbon fiber that when it breaks, it causes MAJOR tissue damage. My friend and I are currently working on accurate and functional horse leg prosthetics. I’ve been riding, taming, and training wild and domestic horses since I was 5, and it’s a passion of mine. We started off by studying their anatomy thoroughly and are now on the topic of what materials would work best for their environment and movement. We hope to be able to make prototypes soon. When making a prosthesis for a horse it’s important to use materials that are super durable & wont cause catastrophic failure. We use a carbon hybrid material so that if it does fail, it won’t splinter & cause soft tissue damage. When working with large animals you also have to make sure the device is total contact around the limb so weightbearing is transferred throughout the whole device so pressure is decreased at the bottom of the limb. Biomechanics & physics are very important when it comes to designing a device for a large animal. We’ve seen how plastic doesn’t hold up very well & in very cold tremps it can become brittle, hot temps it can loose its structural integrity.